The majestic yew is a tree of ancient legend and magic, revered since the time of the Druids as a symbol of immortality and regeneration. Commonly found in churchyards, yew has long been associated with death, rebirth and new beginnings thanks to its evergreen foliage and remarkable longevity. Yew trees a mere century old are considered youngsters, with most living for 400 to 600 years and the eldest topping a millennium or more. 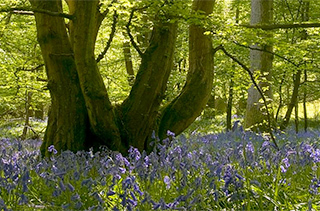 Sussex is home to one of the finest yew woodlands in Europe, at Kingley Vale National Nature Reserve just outside Chichester, where you can walk among some of the oldest living beings in Britain. Steeped in atmosphere, each scaly-barked monolith within the ancient yew grove is a unique individual, shaped by the centuries and battered by countless storms. Some have a multitude of drooping branches that create living tunnels and striking natural architecture, often likened woodland cathedrals. Where the branches touch the ground they will root into the soil and sprout to form new stems with fresh, feathery green foliage – even when the rest of the gnarled old tree looks dead. 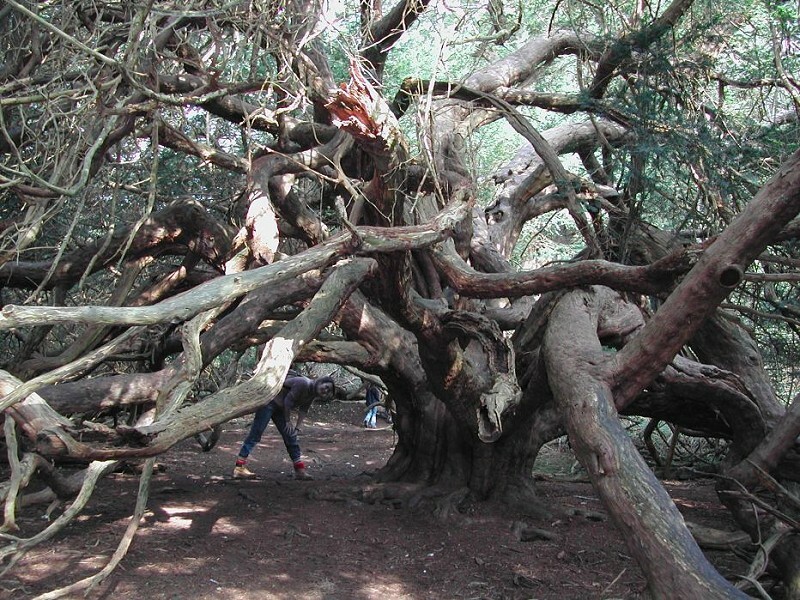 It would take three adults linking hands to completely surround the girth of the oldest yew trunks, many of which are completely hollow, and the fact that they are still standing is testament to yew wood’s incredible strength and durability. One of the oldest wooden artefacts in existence is a yew spearhead that has survived for an astonishing 400,000 years. Unlike most conifers, which produce cones, female yew trees encase each seed in a bright red berry-like structure known as an aril. These are open at the tip and shaped like a cup, and are the only non-toxic part of the tree. Blackbirds and thrushes will happily feast upon them, perhaps oblivious to the risk of imminent death if the toxic seed is accidentally crushed or split in the process. Still, most seeds pass straight through quite safely and are deposited elsewhere, so it’s an efficient form of seed dispersal for the yew – although some birds, like the greenfinch, are able to remove the toxic seed coat to access the nutritious treat within.